The holidays are a time for bubbles! Sparkling wine compliments any celebration. After all, sparkling wine is a wine of celebration, according to Daniele Cernilli, aka DoctorWine and author of The Essential Guide to Italian Wine. So, if you doing any last minute planning for New Year’s Eve – or for that matter just looking for some sparkling wines to enjoy in the New Year – look to Italy. 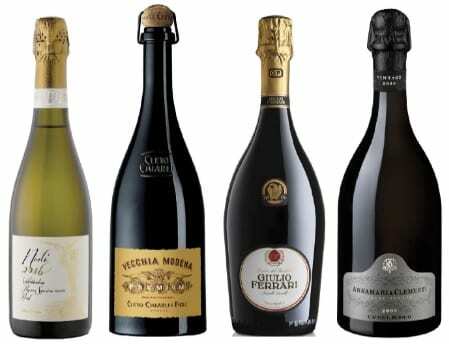 Italy offers a diverse selection of sparkling wines. There is Prosecco, Lambrusco, Trentodoc and Franciacorta. And these wines can be enjoyed any time as they will not break the bank. You can read more about Italian sparkling wines and some recommended producers in the story I wrote for Caviar Affair about Festive Italian Wines for the Holidays. The story originally appeared in the Napa Valley Register. I spent the past week traveling around California with Daniele Cernilli, aka DoctorWine. Daniele is one of the most renowned wine critics and journalists in Italy and he came to California for a series of wine seminars and tastings for both the trade and consumer in conjunction with his book The Ultimate Guide to Italian Wine 2018. While I was organizing these events, I worked with him to design menus for four meals to pair with the wines. From planning the menus to sitting down for the meals, I absorbed much of the insight he had to share about the importance of food and wine pairing. Daniele made a point of the fact that Italians eat and drink together. They believe that wine is meant for food and explained that pairing wine and food “is a religion for us.” There are many considerations when it comes to food and wine pairing, and Daniele offered a few key tips.